As minheap_pushdown() and minheap_raise() have O(log k) cost, the total cost of this solution will be O(n log k). This is better than O(n log n) if k grows slower than any power of n (if k is constant or O(log n), for example). n log n (copying): it just sorts a copy of the input array and copies the top k elements. 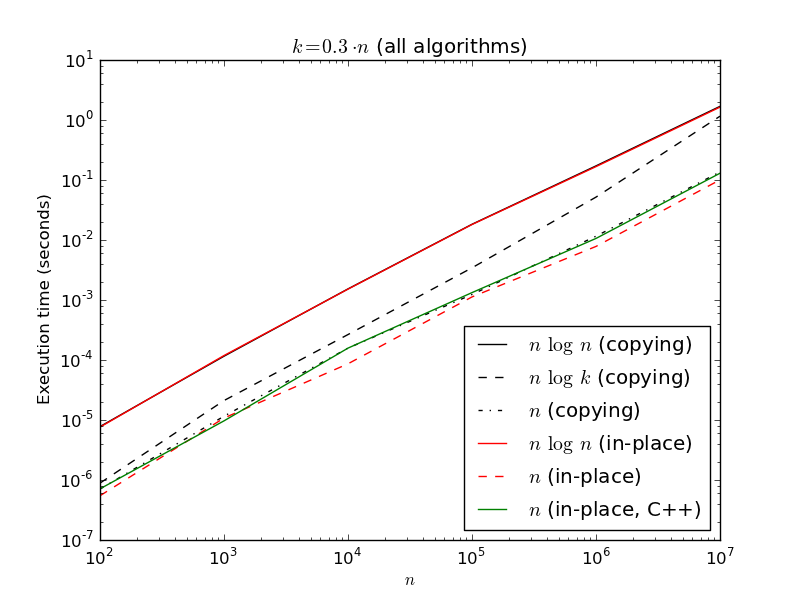 n log k (copying): scans the input array, keeping the top k elements in a heap. n (copying): applies the O(n) in-place algorithm over a copy of the input array. n log n (in-place): sorts the input array in-place and returns a pointer to the top k elements. n (in-place): applies the O(n) quicksort-derived algorithm that was described in the previous section. Execution times for all the algorithms when k is fixed at 30. 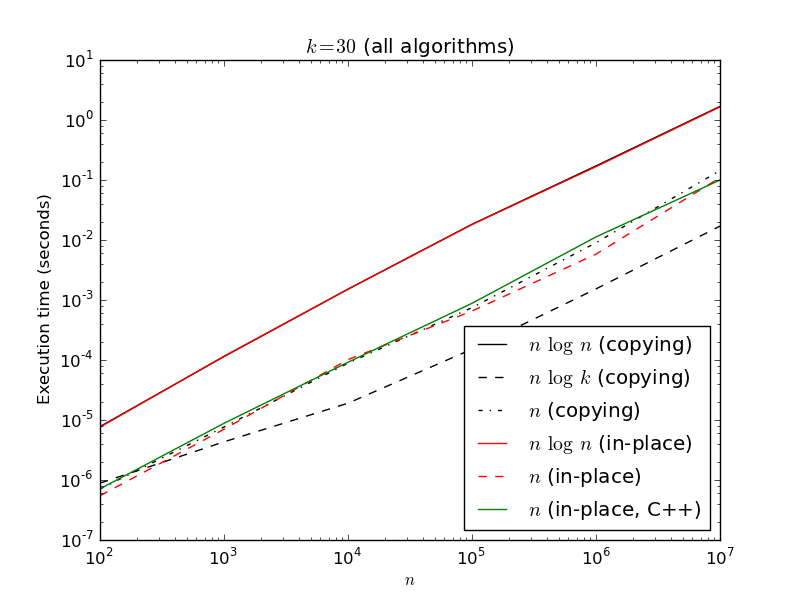 As k has a fixed value in the previous plot, the O(n log k) algorithm is effectively an O(n) algorithm. In fact, it performs better than the truly linear algorithms, probably due to cache effects. Another thing that can be seen in these plots is the difficulty of seeing the difference between n and n log n in a log-log plot, but that is something to be expected. Execution times for all the algorithms when k is 30% of n.
Here the qualitative behavior of the O(n log k) solution is the expected one. The C implementation of the O(n) algorithm looks surprisingly good, with a performance competitive to the C++ implementation included as part of the standard library.